WYSIWTF at A List Apart is by Karen McGrane. I’ve shown her videos and linked to her speeches here several times lately. It’s because I’m convinced she is the most important thinker working on the web right now. She’s not talking about responsive design, which is important, she’s talking about content. How to make content that works. How to create CMS tools that let authors create content that works. How to get away from WYSIWYG and its formatting tools, and move into the underlying structure of content. How to make content useful. She’s an evangelist who’s out to change the web. In case you may have blown off the previous mentions of Karen McGrane on this blog, I remind you of her keynote at Drupal Con, and the video of her talk called Adapting Ourselves to Adaptive Content. You know drones are soon going to be everywhere when they start using them to deliver pizza. Technology replaces the pizza guy. Not much is left that isn’t changed forever by technology – especially privacy. The Best Apps for Educators at Media Shift has 8 useful ideas. This is Karen McGrane’s talk at the BDConf in April 2012, but I just discovered it. It’s extremely important information about the future of the web and content publishing. It’s a year old, it’s an hour long, and it’s completely worth your time. Here’s how Karen McGrane introduced herself during the talk, in case you aren’t aware of how valuable her insights can be. So I do a lot of work with publishers, mainstream publishers. I led the redesign of the New York Times a few years back. I’ve dragged more magazines kicking and screaming onto the Internet that I can count. I’ve done lots of work with Condé Nast. I did the redesigns of the Atlantic and Time Out and National Journal and Fast Company. I’m doing a little bit of work right now with Time-Life. And I really like talking about the challenges that publishers face in relation to broader content strategy challenges that lots of other organizations are going to face. Because I think publishers, they’re like the canary in the coal mine: they face some of these content challenges more acutely, they have to adapt to changes in their environment more quickly. Karen McGrane – Adapting Ourselves to Adaptive Content, BDConf, April 2012 from Breaking Development on Vimeo. I admit that part of the reason I’m so enchanted with this speech is because it says so well what I’ve been trying to say for some time in Web Teacher’s Seldom Asked Questions and Keep it Clean: Your Blog and Clean HTML. Geek Mom recently published a post by Sarah Pinault called Using HTML in Your Daily Life: The Rise of Fake Code. In this interesting essay, Sarah discussed the use of fake HTML tags in everyday communication. She cites examples like <rant></rant> and <giggle></giggle>. The Husband: The beauty of the rant tag is you don’t need the ‘!! !’ <rant>Everyone is using my stuff.</rant> It adds context. Me: Wait, are you dissing my use of fake HTML? The Husband: No, no, no… The point is that the tag takes a totally innocuous statement, i.e., “Everyone is using my stuff” and makes it so you read it with the intended ‘rant-voice’ in your head. 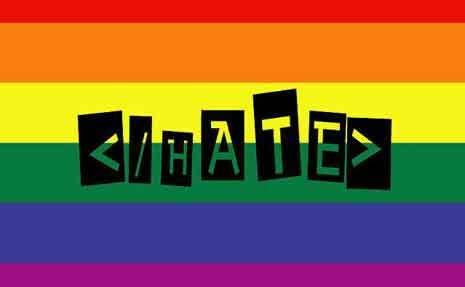 It hit me in looking at Sarah’s fake HTML, or in examining the fake HTML in the plea to end hate shown in the image. When people make up fake HTML, it’s semantic. Without even thinking about it, they make up a tag that expresses the semantic meaning of exactly what they are trying to say. Without thinking about semantics at all. As readers and speakers, we grasp the semantics of words and how the semantic underpinnings of language affect what we mean when we talk and write. And we can apply that with ease to our fake HTML. What I’d like to have you think about today is the semantics of real HTML. HTML is a semantic markup language. Using it semantically helps your readers make sense of your content. But here’s the problem. Many people are using tools that encourage them NOT to think about semantics. The tools confuse and befuddle and we end up doing the exact opposite of what we would do naturally and without effort if we understood the tools just a little better. Instead of creating semantic HTML, we create a semantic nightmare. Here are some tips to help you understand (and be the master of) the tools you use to blog. Most blogs and HTML editors have a similar set of tools. First, I want to talk about the icons that say B, I, and show quotation marks. These tools in your formatting toolbar carry particular semantic meaning. When you use the B icon, you see your words made bold. But the semantic HTML tag that is creating that bold effect is really a <strong> tag. The semantic meaning of <strong> is strong emphasis. While you may want your words to be bold just for presentational reasons, you are giving your words the added semantic meaning of strong emphasis. You need to think about whether you want those words to look bold just because you like they way it looks, or whether you want to give the words strong emphasis. If you want strong emphasis, use the B icon to create a <strong> tag. If you want bold just for looks, take a side trip into the HTML tab or view of your post and add the bold tag by hand. That’s right, hand coding. The tag for bold is <b>, which you close with </b>. Headings (h1–h6) are bold. Automatically. Headings have a semantic meaning, too. They are headings. I know that sounds silly, but they are meant to be a section heading or title. Using a bolded (or strong) paragraph to create something that looks like a heading doesn’t provide the same semantics. The bold (or strong) words are strongly emphasized but are not headings – and that may cause navigation problems to people who use devices that can navigate by jumping from heading to heading. It’s easy to make something a real heading when you mean for it to be one. In WordPress, use the pulldown menu next to the word ‘paragraph’ in the toolbar to find the proper heading. Next is the I icon. when you use it to format words, they appear as italic. But the tag that is created is an <em> tag, which stands for emphasis. The <em> tag has semantic meaning. It gives words emphasis. If you want italics for effect or for looks, pop over into the HTML pane and hand enter the <i></i> tag to make your words italic. There are two caveats with italic text. First, in HTML4 and XHTML, the <i> tag had no semantic meaning at all. It was simply decorative text. Starting in HTML5, the <i> tag now means the words can be in a foreign language or can be a title. Bottom line, in HTML5, <i> does have semantic meaning. Then there’s <cite></cite>, which means a citation. It displays in italics, but it is a citation of a title of a book or movie or web site name. Use it like this: <cite>Geek Mom</cite> recently published a post . . . Yes, you have to jump into the HTML pane and hand code it. The toolbar icon with the opening quotation marks creates a blockquote. You may be using this one properly already. The semantic meaning of <blockquote> is that you’re quoting a bit of something from someone elsewhere – perhaps a web site or a book. Here’s the problem. When you format something as a blockquote, it displays in the browser indented slightly on both sides. So some people use the <blockquote> tag to indent things. In other words, to achieve a visual effect that has nothing to do with the semantics of the tag. This can be confusing to your users if they are browsing using devices that announce something as a blockquote. They expect a quote. If you’re just doing it for looks, you’re semantically confusing. You don’t want to be semantically confusing. No, indeed. Clarity in communication comes from precise semantics. How should you indent if you can’t do it with a blockquote? The easiest way is to had a few pixels of margin-left in the style sheet to whatever you want to indent on your page. In the style sheet, create a class, perhaps call it indent, add a margin-left rule, and apply the class to anything that you wanted to move over a bit. No semantic miscommunication, and nice appearance. One more problem I see frequently in posts involves paragraphs. Apparently, some blogs use two line break tags to create what looks like a paragraph. A line break is created with a <br> tag. (Sometimes it’s written <br />, but <br> and <br /> are the same thing.) If you string two break tags together like this <br><br>, you get a blank line and what looks like the start of a new paragraph. Paragraphs are semantic blocks of meaning. Each paragraph has one main idea! (Remember THAT English teacher? The one who nagged you about the main idea of a paragraph. I do.) The tag for a paragraph is <p></p>. If you want to start a new paragraph you close the previous one and begin a new one. New paragraph, new main idea. Nice and semantic. If you discover that your particular blogging platform is using <br><br> to create paragraphs see if you can find a way to change it. Or use the “paragraph” formatting tool in your toolbar to make it a paragraph. You never know what kind of browser or device your readers are using to get the content of your web page. The more semantic you can keep your real HTML, the better all your readers will be able to understand the exact meaning of your message. Editors Note: Cross posted at BlogHer. 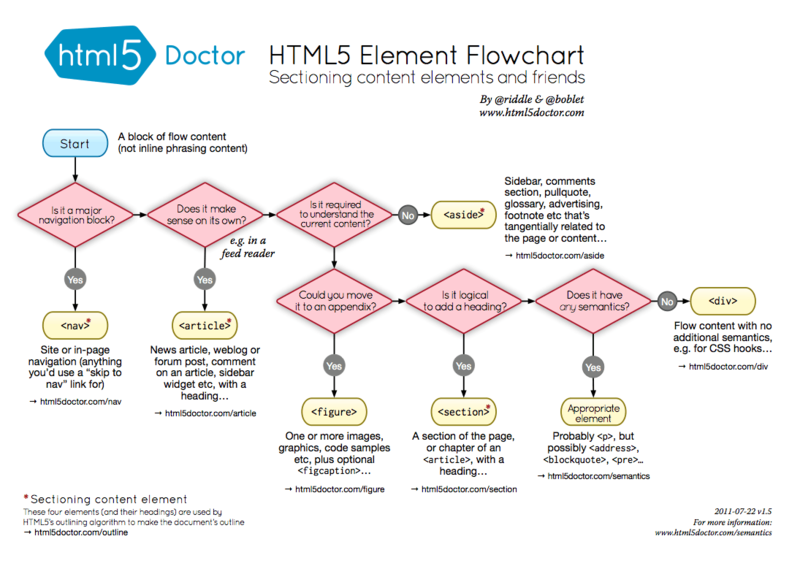 HTML5 Doctor just published a great post on semantics – go read it. It included this terrific flowchart to help you figure out which sectioning element is appropriate for a particular situation. Oddly, there were people on Twitter who didn’t see the humor in that and suggested I should read the books. With my eyes. Because I don’t want you to worry about me, you should know that I am reading them. With my eyes. Conferencepalooza suggests some good conferences for high ed folks. Check it out, there might be a great one there. You do know that SXSW is holding a special pre-conference for EDU this year, don’t you? It’s SXSWEDU. Get out your blue beanie and join Chris in giving thanks for web standards on Nov. 30, 2011 – Blue Beanie Day. Why should we give thanks, Chris asks? Because the bums lost! Think Up is new software that Gina Trapani announced was out of beta yesterday. It does all of what I was wishing Twitter would do plus more with Facebook and Google+. It’s installed or your server or can run from the Amazon cloud for a monthly fee. I think Think Up is going to be big.